Proposals for a new tax on sugary drinks are once again apparently being mulled by the government in a U-turn after David Cameron previously dismissed the idea. The Prime Minister today confirmed the tax had not been ruled out as part of the government's anti-obesity strategy. 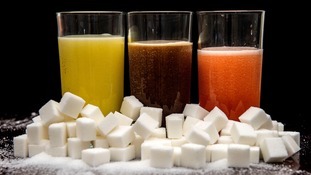 Charities and campaigners such as Jamie Oliver have called for the extra charge to be introduced on sweetened drinks to 'nudge' shoppers towards healthier choices. David Cameron had previously said there were "more effective ways of tackling this issue" while the Department of Health said it had "no plans" to introduce the tax. A spokesman for the Prime Minister repeatedly refused to deny a report in The Times that the idea was back on the table, saying only that the anti-obesity strategy was still "being worked on". Work is ongoing on this. We are concerned about the issue here, the need for more to be done on this. In a press conference in Hungary this afternoon, Mr Cameron appeared to back up the claims - saying while he would rather avoid imposing new taxes on anything, the government needed to act in the best interests of peoples' health. "We need to look at this in the same way as in the past we've looked at the dangers of smoking to health and other health-related issues," he said. "We shouldn't be in the business of ruling things out." Emily Morgan, ITV News political correspondent, said that there was little clarity over exactly what the government is considering with the Department of Health still insisting that there were no plans to implement the measure. Leading charities have made it clear that they back the change, with Alison Cox, from Cancer Research UK telling ITV News that sweetened drinks were a major source of the sugar consumed by school-age children. That is why we think it is important we take on measures like a sugary drinks tax which could help reduce their consumption. Sarah Wollaston, the chair of the health select committee, stressed that the proposed tax would only cover sugary drinks “to help try to drive choices to healthier choices." The latest developments came after a trio of reports out today highlighted the health impacts of poor diets and added pressure on the government to act. One study published in the Lancet found that one million cases of cancer and 300,000 of diabetes could be avoided over the next two decades if sugar in sweetened drinks was cut by 40%. Meanwhile Cancer Research predicted that some 700,000 people were likely to be diagnosed with cancer across the UK over the next 20 years as a result of being overweight. Another study out today from the British Medical Journal also suggested that introducing taxes on high-sugar drinks could cut consumption. A similar scheme in Mexico which added 3p to the cost of a litre of sweetened drinks resulted in a 12 per cent reduction in sales - and a 4% increase in the purchase of unsweetened drinks, researchers found.